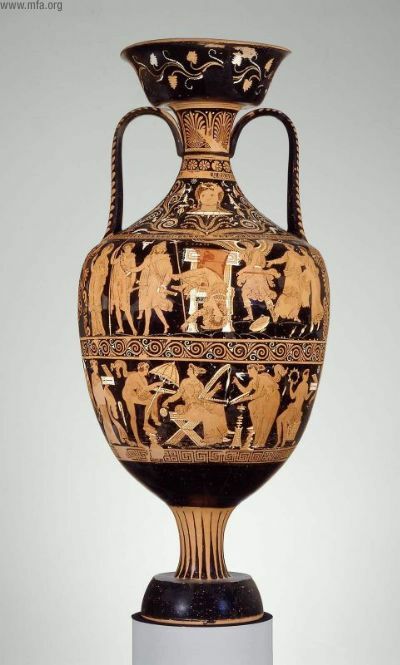 The Museum of Fine Arts in Boston has returned 13 artifacts to Italy, including this amphora depicting the murder of Atreus. The return gets notice in the New York Times as well. This is another in a long line of high-profile efforts by Italy to seek the return of its objects. The MFA press release points out how the museum has been at the forefront of providing provenance information of their works. Curious, I searched for a Degas painting and picked this landscape, and indeed a surprisingly detailed set of provenance information was detailed. I also looked up a Cezanne, and this work, titled Turn in the Road also had a great deal of provenance information. This is quite a fascinating development, and one that has not manifested itself in the literature yet. Ideally, more museums will devote some resources to this kind of endeavor. It would seem to serve a number of good purposes: it may make it easier to track down the work if it one day is stolen, it may limit the potential market for the work, and it allows anyone with internet access to view the work. Last but not lease, it effectively eviscerate a lot of the criticism involving museum and the high profile return of works including MOMA and the Getty. Throwing open the doors, so to speak, and heading off criticism at the pass is a shrewd and welcome move, and seems to be a fairly recent trend.